This past summer I biked across the United States with Heather Hoffman to raise awareness about hunger and food waste. I work at Rotary First Harvest – a program of Rotary District 5030 (Seattle, USA) that combats hunger and reduces food waste. In my role as the Director of our Harvest Against Hunger program, I have a front-row seat to see how hunger directly impacts some 50 million Americans. The position also allows me to see how much food, especially fresh produce, is wasted domestically every year. The majority of such food does not need to be wasted. Instead, it could go to hungry bellies of those in need. Heather and I embarked on this 4,000 mile adventure to see how hunger and food waste are impacting communities from Seattle to Washington DC. We also wanted to learn what people and organizations are doing to fight hunger and reduce food waste. 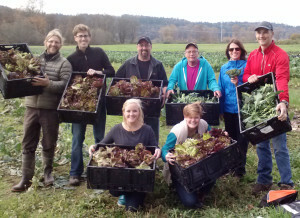 Harvest VISTA gleaning project at Hopelink in Carnation, Washington. Photo courtesy of Rotary First Harvest. During Bike Against Hunger, we saw tremendous energy and enthusiasm, especially from young adults, who are exploring creative approaches to crack the contradiction of hunger and food waste. Harvest Against Hunger (HAH) hires recent college graduates for placements as AmeriCorps*VISTA members in communities to start or sustain local produce-recovery projects. We see this energy very clearly with HAH, and saw similar excitement with organizations like the Campus Kitchens Project and Food Recovery Network that engage college students and the Food Rescue Alliance that uses bicycles (bicycles!) for just-in-time distribution. 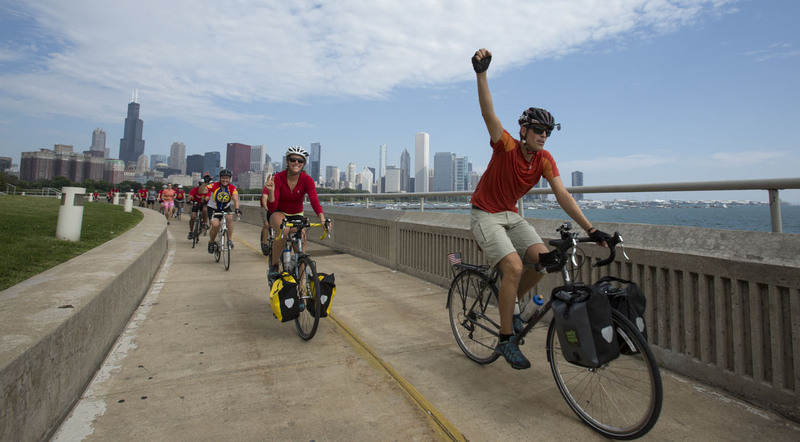 Bike Against Hunger zoomed into the Windy City in early August after cruising from Omaha to Chicago in six days. We averaged 90 miles per day during this stretch, our fastest pace of the summer. We made the push in order to arrive in Chicago for an amazing event Rotary International organized, which highlighted urban farming and gardening in Chicago’s South Side with Growing Home and I Grow Chicago. The video at the top of this post does a phenomenal job showcasing our bike ride from Evanston to the Englewood neighborhood. More than 20 staff joined us on the ride, including RI General Secretary John Hewko and his wife Marga, who are both avid cyclists. David Bobanick, the Executive Director of Rotary First Harvest also participated in the event. This day of Bike Against Hunger crystalized the real and beneficial impact of urban agriculture and how it can rally a community around larger issues, such as poverty, access to healthy food, violence prevention and employment opportunities. The most common sentiment from participants (myself included) on the bike ride was surprise. Surprise that organizations like Rotary International, Growing Home and I Grow Chicago have amazing individuals committed to improving the lives of others. Surprise that many people who live in Chicago never set foot in the changing landscape of the Englewood neighborhood. Surprise to see how urban farming is sprouting change block by block in Chicago’s South Side. Bike Against Hunger illustrated that hunger and food waste is an issue in America and will continue to be for the near future. However, people across the country, and the world, are doing amazing work to address this topic. I feel fortunate to be part of this growing movement to learn, share and mobilize efforts to fight hunger and food waste. Benjamin and Heather leading a group of Rotary staff on a bike ride from Evanston to the Englewood neighborhood in Chicago, IL.